Yes, that’s a cow. In our driveway. 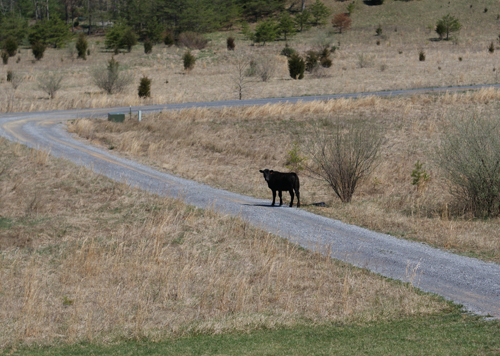 The other afternoon we were settling down for afternoon when we my oldest daughter pointed out the window to a medium size black cow standing next to the house. It took me a few minutes to grab the camera, by which time she was moseying down the driveway. My guess is she came from the farm next to us. We’ll add this one to our memory banks next to the time that we heard a rumble outside and looked outside to see a herd of horses from the neighboring ranch thundering past our house! If you’re a blogger, be sure to check out this year’s Ultimate Blog Swap information. We’d love to have you join us!